Twoblueday is one of my favorite photographers at Flickr. For one thing, he apparently shares my love of buildings, architectural detail, and high-saturation intense color. For another, his photographers reflect that gift for composition that separates wonderful photographs from works of art. Furthermore, he picks out the details that reflect that Florida glamour that's always floating near the surface. This is from the town of Sanford in Central Florida, a town I once knew well. 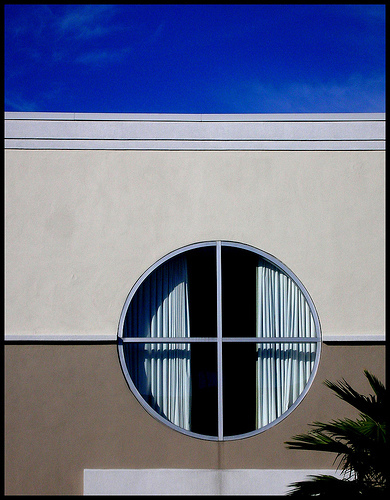 'Round window and Sky' by Twoblueday (Gerry) | To see his other photos (Flickr photostream), click here | website: Twoblueday | To see the full-sized version of this photograph at Flickr, click here.